We are committed to maintaining the trust and confidence of all our clients, virtual pilgrims, readers, viewers and website visitors by ensuring that your privacy is protected. We do not sell, rent or trade our information, email lists, or any other visitor data with any other companies for marketing purposes, we never have and never will. We collect PII from you with your consent in a variety of ways, including, but not limited to, when you visit our site, subscribe to the newsletter, download our free book, purchase a product or service and in connection with other activities, services, features or resources we make available on our Site. You may be asked for, as appropriate, name, email address, mailing address, phone number, payment information and provide an updated on your progress if you partake in a coaching relationship. You may, however, visit our Site anonymously. We will collect PII from you only if you voluntarily submit such information to us. You can always refuse to supply PII, except when it may prevent you from engaging in certain Site related activities. Whenever you interact with our Site, we may collect the browser name, the type of computer and technical information about your means of connection to our Site, such as the operating system and the Internet service providers utilized and other similar information. Consent is provided at the point of collection of your information in connection with either, a third party payment platform, a mailing service such as Mailchimp when you share your email to download or receive Goji Fitness content or when you expressly consent to complete a health questionnaire off our website. We only collect the minimum information appropriate to deliver to you the service you are accessing and we only ever use this information to better understand your needs and provide you with a better service. We may use your email address to send you information and updates pertaining to your order. It may also be used to respond to your inquiries, questions, and/or other requests. If you decide to opt-in to our mailing list, you will receive emails that may include company news, updates, related product or service information, etc. If at any time you would like to unsubscribe from receiving future emails, you may do so by contacting us via our Site. To deliver a product or service. We use your PII to fulfill orders and deliver health, nutrition and exercise coaching. We do not sell, trade, or rent users personal identification information to others. We may share generic aggregated demographic information not linked to any personal identification information regarding visitors and users with our business partners and advertisers for the purposes outlined above. 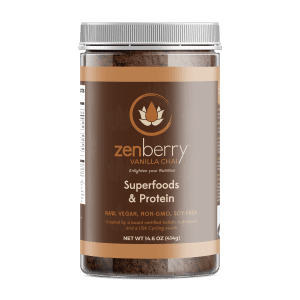 When you purchase Zenberry through an affiliate link or you sign-up to be a Zenberry affiliate through another Zenberry affiliate, we share your contact information with that particular trusted affiliate, enrolled in our Zenberry Affiliate program, and with whom you made contact with us. It enables them to see how their Zenberry social media or other marketing outreach reconciles with sales. We do not share credit card information, SSN nor Tax ID numbers. We will never send you an email asking you for any personal information, this includes your address details or payment details. If you receive an email which appears to be from us asking for this information then please contact us immediately straight and do not reply to such an email. You can unsubscribe from our emails at any time you choose with one click using the unsubscribe link included in the footer of every email we send you.